WJ is none other than my GUITAR. Violinists and flutist at home, but I chose the Guitar as the musical instrument to be adept in. So, anyway, I joined classes. Bought WJ for 3500 rupees, bought the accessories and went for the classes. I could have learnt it at school, but since I chose Singing as my activity in school, I had to learn outside, plus, not to forget, the inferiority complex when surrounded by the school band members was a little too much to handle. I wasn’t that confident back in school, as I am now. An easy target for bullies, introverted and quiet. The today-me is definitely singing a different tune. Thankfully. I suppose, I must take “ambitious” off my character-defining-adjectives list. Yet again, another failed attempt at something. Every time I pass by my guitar class, I look the other way, ashamed. I should have learnt an instrument, but didn’t. I’ll be trying my hand at Violin soon, probably, to add to this list! Task #2: When I did not give my Elementary AND Intermediate exams, despite preparation. So, what do you call a person who really prepares for an examination, like, works hard, practices during school, after school, joins a class, buys materials for the same, practices through many books, and yet, doesn’t take the actual exams on account of school’s internal exams? A person devoted to conventional education or a wuss? Since it’s me here, both. Yes, I did it all. Everything that I have mentioned in the previous paragraph, I did it all. I will not re-type it, as that’ll just be scratching the scab, wishing for the wound to reopen and bleed. So, sadist, be satisfied by letting your eyes move up and re-read everything I did to excel in the exams; the exams I ended up not taking. The Elementary exam, if chucked was still fine, as you could always directly take the Intermediate ones. For those who do not know what these are, they are Art exams. These test you on your drawing skills, with oil pastels, paint; your ability to draw the given still life or geometric shapes (complicated ones, obviously), scenes out of memory, calligraphy, etc. So you study, you practice painting, coloring, drawing; learn perspective, shading, etc. Needless to say, I did all of this. But I did not take the exams. After chucking the Elementary exam, I thought, that’s alright, the next one is still there. I practiced more, engaging even the school art teacher, staying back in school every other day… But I did not take the exams. YES. YOU READ IT CORRECTLY. DON’T JUDGE ME! This is all my Dad’s fault. Period. It is! He had promised me that he will get the puncture repaired, but never got a Sunday to do it! He had immense workload and I was a dependent Daddy’s little girl who only knew to throw tantrums and get her work done from Daddy.. (If you read this, Dad, know that I love you for putting up with it!) On a side note, that hasn’t changed much over all these years. Training wheels intact, I used to ride it around every evening until that dreadful day…….. The wheel got a puncture and I couldn’t ride it around anymore. Sigh. Long story, short, it wasn’t ever repaired, I never got back on it, I never learnt without the training wheels and I never ever learnt to balance it. I had a plan to learn it before I crossed my teens, before I turned twenty, but that never happened like a lot of things that never happened. The bicycle was left to rot in the balcony and was used to sit on or as my form of exercise, a way to pass time while I watched Pokemon, actually, and was eventually given away. P. S. I do intend to get back on the bike soon now. I do. I shall write about it the day I successfully balance it! I will! And you have to promise to rejoice with me that day, okay?? 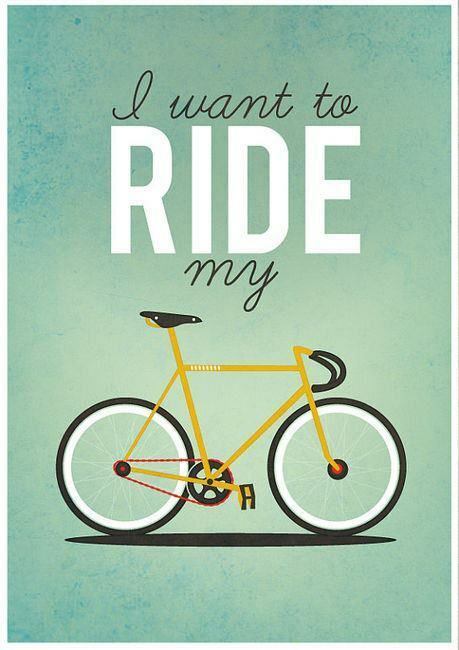 Get on the bike! 🙂 My mum only learned to ride a bike in her 30’s when my sister and I started to learn as children. She persevered until she mastered (okay, maybe more managed than mastered) it so she could ride with us to the local park. Oh and I could never click with the guitar even though I so badly wanted to be able to play. Years later I bought a ukulele on a whim and found that much easier. Two less strings!